Smart home accessory purveyor iHome is shipping the iSS50 5-in-1 SmartMonitor, allowing users to monitor not just motion like most sensor packages, but humidity, temperature, and more, enabling complex HomeKit actions based on a variety of environmental conditions, all detected from one device. 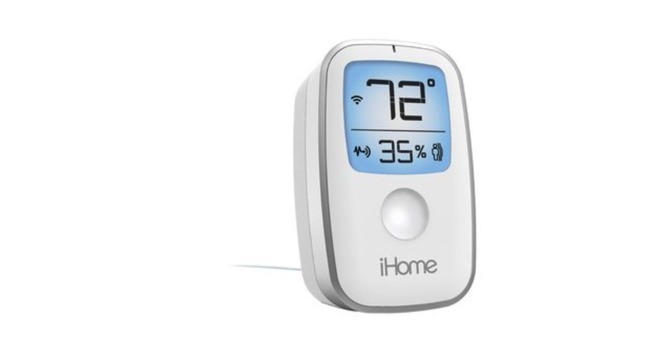 The iHome iSS50 5 in 1 SmartMonitor is an environmental multi-sensor that alerts users to changes in room temperature, humidity, sound, light and motion either through its app, or through HomeKit integration. By implementing the new device in a smart home setup, users will be able to automate functions based on environmental conditions within their homes, such as automatically turning on lights when sound is sensed, turning on or off fans based on room temperature, turning on a dehumidifier when humidity levels rise, and other similar actions. The new SmartMonitor works with iHome Smart Plugs to toggle power to connected appliances and lights, and also works with other HomeKit-enabled accessories to set triggers based on any of the 5 sensors. In addition, iHome's line of SmartPlugs are compatible with other platforms including Amazon Alexa, SmartThings and Wink. The iSS50 retails for $80, and is available now through iHome. Introduced in 2014, HomeKit allows users to connect to a variety of compatible home automation devices through one common iOS Home app, as opposed to a series of disconnected interfaces. The addition of Siri control to HomeKit allows for complicated sequences of events to be induced from an iOS device or a Mac running Sierra. Apple CEO Tim Cook said during October's quarterly and annual financial results conference call that there will be more than 100 HomeKit compatible products available before the end of this year.